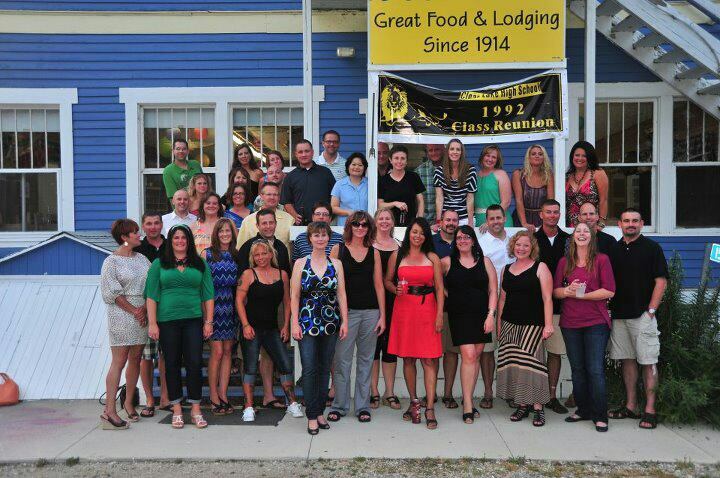 We would love to hear any ideas or comments you have for future memorable reunions. Click HERE to send your ideas or comments! Married names omitted for space. Front: Jodi Minard, Mike Andrews, Josh Goslin, Molly McAllister, Michele Punke, Sabra Aswegen, Danyelle Keeney, Robert Moor, Chad Trebil, Carrie Dirks, Brenton Young. 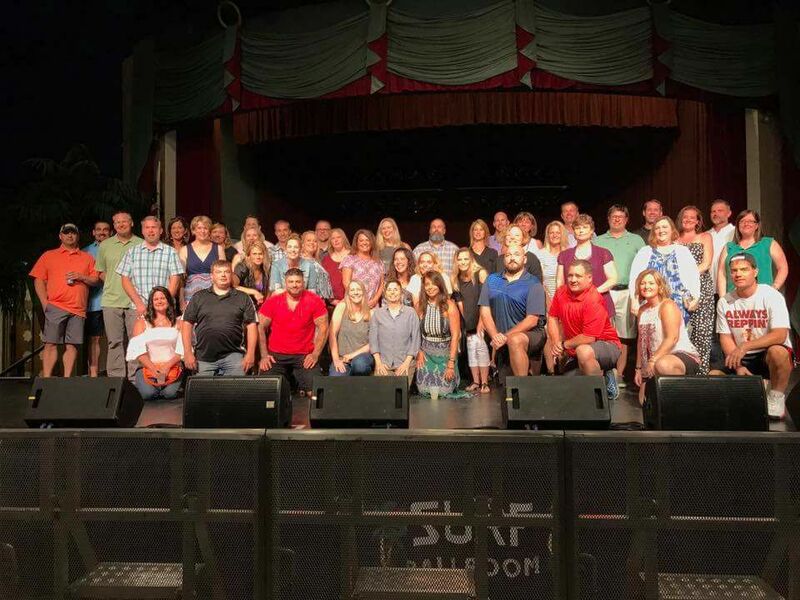 2nd row: Mark Moeller, Kathy Albrect, Jolene Weaver, Renee Sheahan, Jennifer Stealy, Jodi Davis, Danielle Aastrup, Erin Clancy, Heather Sonksen, Brittany Snook, Leslie Reynolds. 3rd/back row: Chris Golien, Chris "Jack" Christ, Scott Johnson, Addy Rogers, Julia Jacobsen, Kara Foehrkolb, JD Miller, Dan Thul, Raechel Ulstad, Mark Law, Michele Kruger, Cathy Crews, John Hanson, Stacey Scott, Marty Fredericks, Kim Moore, Heather Asche, unknown to webmaster, Chris Henningsen, Scott Schroeder, Trisha Schroeder, Shane Cooney. Click HERE for the photo gallery of our 25th reunion! Friday, June 29: Happy Hour at the Other Place. Saturday, June 30: Cocktails and dinner at PM Park. Married names omitted for space. Bottom Row: Jessica Jurgensen, Jodi Minard, Becky Matson, Heather Sonksen, Kim Moore, Sabra Aswegen, Leslie Reynolds, Erin Clancy, Molly McAllister. 2nd Row: Shane Cooney, Abby Ragan, Kurt Vala, Nick Henningsen, Cathy Crews, John Hanson, J.D. Miller, Jay Barragy, Marty Fredericks, Chris "Jack" Christ. 3rd Row: Cory Shook, Trisha Schroeder, Scott Johnson. 4th Row: Jolene Weaver, Kristen Bohman, Kim Hayes, Robert Moor, Chad Trebil, Phan Lai, Michele Punke, Renee Sheahan, Jenny Meseraull, Anna Means, Jennifer Stealy. 5th Row: Scott Schroeder, Addy Rogers, Cathi Courrier, Mark Law, unknown to webmaster, Steve Spratt. Click HERE for the photo gallery of our 20th reunion! Wednesday, July 3: Decorated the float for the parade. Thursday, July 4: Class of 1992 float in the parade. Friday, July 5: Golf day. Saturday, July 6: Family day at PM Park, followed by dinner and dance at PM Park's ballroom. Have pictures of our 10 year? Please contact the webmaster to get them on our site!